I shut it in a door at work. As I walked through the doorway, I reached behind me and grabbed the handle with my last three fingers and gave it a hard pull, leaving my index finger in the perfect position to get crunched. I couldn't breathe for a minute when I did it. My finger wouldn't move, I was afraid to look. I was unpleasantly surprised to find it bleeding. In hindsight this is a blessing, because the blood isn't building up underneath the nail = pressure= OUCH. It seems weird to consider something painful as a blessing, doesn't it? But I am sure it would be hurting a lot worse right now if it hadn't bled. I also managed to shut my finger in the door right in the middle of the nail, vs. at the knuckle, which would have been really bad. Pain is a part of life. Sometimes it's a big part, and sometimes it isn't, but either way, it's part of the big puzzle, the deep music, the great game. Pain does two things: It teaches you, tells you that you're alive. Then it passes away and leaves you changed. It leaves you wiser, sometimes. Sometimes it leaves you stronger. Either way, pain leaves its mark, and everything important that will ever happen to you in life is going to involve it in one degree or another. Well, I know this pain will leave its mark, and hopefully my nail won't fall off in the process. In all honesty, I could do without the sore finger, especially since it's my dominant hand. However, sometimes these mishaps serve as a reminder that things could be worse. 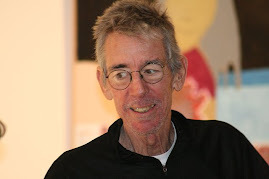 If we don't experience pain, how can we appreciate love and joy and beauty? So, I am thankful for the reminder. And I'm also thankful for all of the other wonderful, and not so wonderful, things in my life. I'm lucky. It's been over a year since I blogged. A whole year! A lot has happened in this past year. So much, and in ways, so little. It's been hard to blog about it, because sometimes I just don't want to put things out there, you know? Putting things out into the big world can make you feel vulnerable. So, in a nutshell... we looked and looked and looked at houses. After a while, it wasn't fun. It was tedious. It was a power struggle. So, we went to Plan B- begrudgingly- and rented a house. I say begrudgingly, because most people have the attitude that renting is "throwing away money" because you are not building equity. But, and a big BUT, it does buy time. And relief. So, we are caring for a house that isn't ours. Mowing a lawn that isn't ours. Painting rooms that aren't ours. Well, not ours in the long run, but ours for now. And that's enough for me. 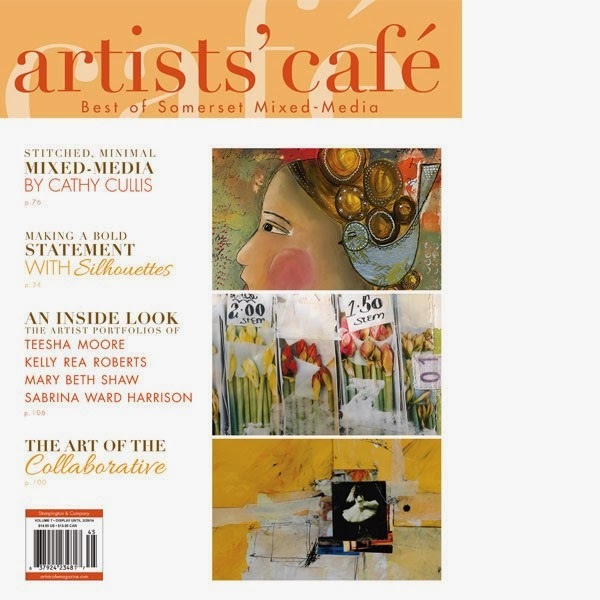 I am very proud to announce that a previously published piece on my little altered book "Lyrical Interpretations" is being included in the Winter Issue of Artists Café!! (see the link on the sidebar). 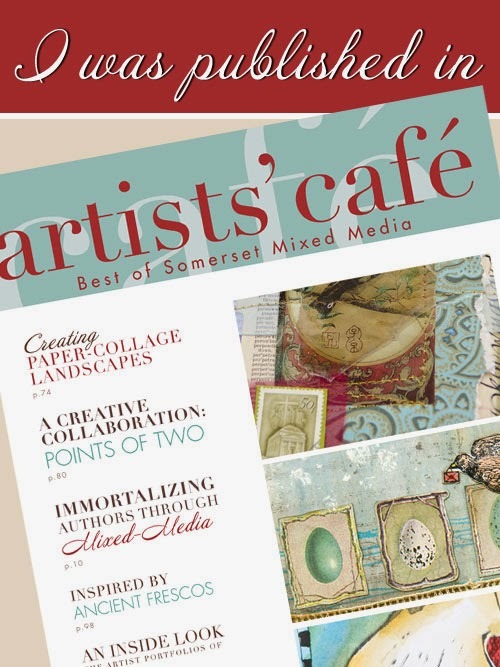 We’re unveiling brand-new features in the newest installment of Artists’ Café, including the addition of artwork from bestselling publications, Somerset Apprentice, Sew Somerset, Art Journaling, and Somerset Workshop. 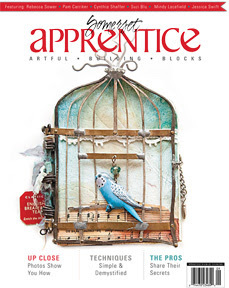 You won’t want to miss Hanne Matthiesen's year of stitching project, the bright and brilliantly stitched art journal of Roxanne Padgett, or an up-close look at the portfolios of multiple top mixed-media artists. I am very excited, and very honored. I love this book, but I'll be darned if I know which box it's packed in... Which is a shame, because I still have some pages to be finished! Hmmm, I will have to go look for it. Thank you, Stampington, for including me. It makes me want to create and submit again!! PS- I will add picture soon! As I mentioned in my previous post, I was recently in Georgia at my friend Tammy's house. I knew I wanted to bring something for her and Luz. I received a very timely email from the Brave Girls Club shoppe, and voila!! (Let me just say that I love these women, love their site, and their philosophy! I get a daily inspirational email too). I bought us each a matching little clutch. It's the perfect size for some cash, lipstick, and a credit card. In fact, I carried mine to the Country Living Fair. I also bought Tammy and myself a necklace, as she was having a birthday. This one is mine, and it looked great with a crisp white shirt (gotta love some sparkles!). Tammy's is a bit different, but of course I forgot to take pictures of it! The Brave Girls Shoppe has so many pretty things! I bought myself a great frame too. It all was shipped in a timely manner, and came lovingly wrapped in their signature tissue paper. I would certainly recommend shopping there- and Christmas is coming! A few weeks ago I took a much-needed mini-vacation to my friend Tammy's house in Georgia. Tammy and I have been friends since our days at Rosemont College! We lived next to each other sophomore year, and then lived together our junior and senior years. I am embarrassed to say that I have not seen her in person in 5 years!! Five whole years!! We have Skyped, talked on the phone, but no in-real-life visits. So sad. Wow, can life really get in the way! Another pal met us there- Luz Foster. Tammy and I met her at an Outer Banks scrapbook weekend in 2007 (I think). Then Luz, brave as she is, hopped on a plane and came to Girls Weekend 2008. Tammy and her husband met Luz and I at the airport. Luz landed first, then I found them by the baggage area. I actually burst into tears seeing them! My Friend Gas Tank was seriously low. We headed to Gladys' and Ron's restaurant in Atlanta for some traditional waffles and wings. Weird, right?? Who eats that stuff together? But after an early morning flight, the smell coming from this place was heavenly. YUMMY. Then we headed back to Tammy's house and hung out by her glamper camper Rosie. We sat outside and talked, shootin' the breeze. It's amazing how we just picked up where we left off. Gotta love girlfriends!! That night, we had a crafting night with more friends, and made some really cute stuffed skeletons for Halloween. Tammy has an amazing studio. She provided everything we needed for the night- including cupcakes and these hand-decorated bags that held our kits. This gal is an amazing hostess!! She thinks of everything. Friday we drove a few hours north at hit the Country Living Fair at Stone Mountain. We walked around for about 7 hours! It was cold out there, especially since most of the tents and vendors are set back in the trees. But, it was gorgeous out. We took a lunch break, thanks to the (once again, amazing) lunch bags packed for us by Tammy. There were tons of vendors there, lots of stuff to be seen and bought. I picked up a burlap runner and some old drawer pulls to tie them with, and some large bedsprings to use as candle holders. I have seen lots of small ones, but never ones as big as these. Saturday we hit Hobby Lobby- my first time. We walked around for a long time, oohing and aaahing. Luz turned me on to Becky Higgins' Project Life scrapbook supplies- and I'm hooked. 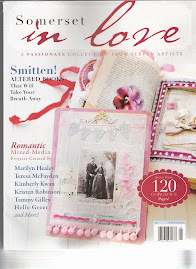 I have been really wanting to get back into scrapbooking again- and this was the perfect way to get started. We each bought a themed box, and split the stuff up amongst us. Luz also turned both me and Tammy onto the whole Filofax craze, and we spend a good portion of the day looking for stuff- including these cool Bic pens with 4 colors of ink, and not just your standard blue red green black. Oh no, we got the pastel ones! All this shopping goodness was followed by a fantastic Italian dinner out with Tammy and her husband Don. Gotta love a real man! The summer is flying by. It's amazing how the weeks just disappear.This time last year, we were in Maine, enjoying a much cooler summer. It's been hot and rainy here in Pennsylvania. It rains almost every day. We had over 10 inches of rain in June, with the normal being 3! There is a pool down the road from my parents, and when the weather was good, it was an absolute God-send for the kids. Both boys have turned into little fishies- such a big change from last year! I'm sure both boys would benefit from lessons. Jason is riding every week at a local barn. His pony is too green for him, so I ride her. Yeah, me the giant on this little pony. But, I am light enough for her to carry, and so we do our best. It would help if the ring wasn't so muddy and slick! I am sure you're dying for photos, but I can't find one just now. I will post one later. Enjoy your holiday weekend. I am on-call, so I have to stick close to home. I am thankful to live in this country!